How long is an ArtisTTable retreat? Typically 7 days, although we also offer specialty retreats that are 3 or 4 days (see: “Figure it Out Retreat”, Traverse City, Michigan). Does the ArtisTTable go to the same places every year? 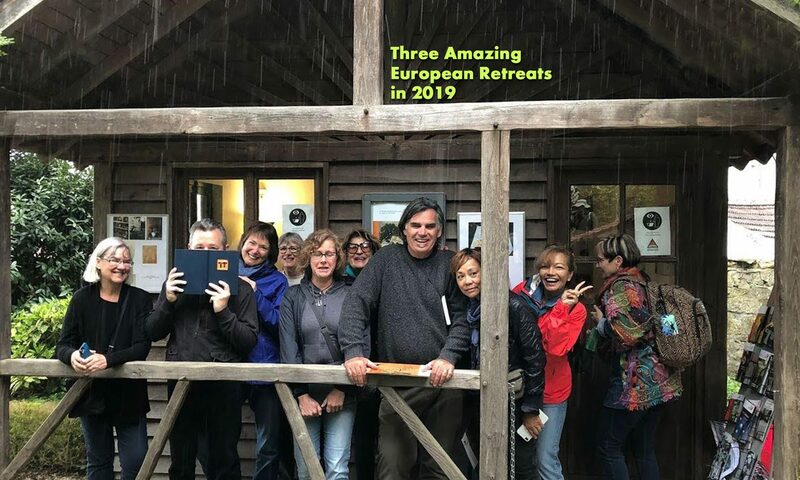 While we have found several locations that are particularly inspiring that we return to again, we are always branching out and doing our best to add new locations to every retreat season. What language is spoken at the ArtisTTable retreat? The primary language spoken at the retreats is English, though Royce and Tali are also proficient in Dutch and Hebrew. All instruction is in English, but can be repeated in Dutch or Hebrew upon request. Sleeping arrangements vary depending on the retreat. Since we usually stay in the local environment of wherever we go, the arrangements tend to differ per retreat. Single rooms can be available, but more typically rooms are shared, and bathrooms are shared. What are the eating arrangements like? ArtisTTable meals are a special time! We love to meet around the table and share mealtime. Breakfast is often quite casual and where we start our days off right, with food and an outline of the days activities. Lunch is provided midday at the house unless we are off on an excursion, then we prepare a picnic lunch unless arrangements have been made to eat elsewhere. Dinner is a hearty and delicious meal prepared by our cook that will most certainly satisfy you after a hard day at the field easel. You are welcome to bring your own equipment to any of our retreats, but we realize that depending on where we will be that bringing your own supplies can be a challenge. For those that choose not to bring their supplies with them, we have put together art supply packages with either acrylic or watercolors that include, the paints, brushes and paper and/or canvas. Every ArtisTTable Retreat participant is presented with a sketchbook and 6B pencil when they arrive in their welcome packet/goodie bag. How do I get to the ArtisTTable retreat location? There is a good chance that you will need to fly to the nearest city or airport unless you are driving. If there is train or ferry travel to get you as near as you can get to where will be based, we will pick you up and transport you and your gear to our location. The cost of the retreat does not include airfare or travel to the retreat location. While we have a schedule of events for each retreat that will instruct and inspire, you get to decide how you spend your time at the retreat. If you choose not to be a part of any particular workshop or demo, you most certainly can opt out. You also can come and go as you please. If you want to go somewhere that is in the opposite direction of where we are planning, you will need make your own arrangements for transportation and food. I can only do a few days. Can I still register? There are those times when someone cannot be at the retreat the entire time. You can still register and when you do you can let us know if you need to come late or leave early. Partners are welcome whether they are artists or not. Very often non-artist participants join in all of our activities and do very well, as well as having a great time. Are there any discounts or reductions? If you register more than one person at a time we offer a reduction, and often throughout the course of our promotions there are limited time special offers that we make available. I’m sold! Where can I book? Great you want to join us, we can’t wait to have you! You can book any of the retreat here. See you there!